Arrow Shape Wood Name Sign - - Carved wood arrow sign points to your home, backyard pool, cabin, camp site, tailgate party parking spot, drone landing pad, team's track meet tent, or maker market booth. 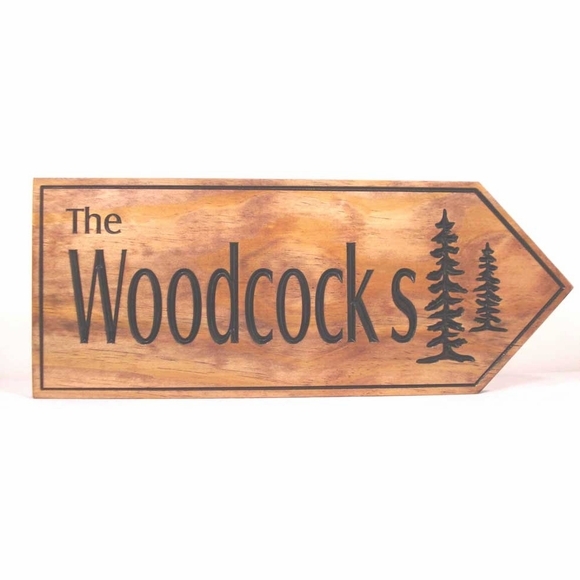 You'll think of hundreds of uses for this rustic theme directional sign. Personalized solid pine wood directional sign made in USA. Sometimes referred to as our wood arrow address sign. Point guests in the right (or left) direction with this arrow shaped family name sign. Personalized with the name you supply and the arrow direction you select. Wall mount (or stand on an easel for temporary use). Sign includes pine tree accents and a thin border that echoes the arrow shape. Three sizes: 18"W x 7"H x 3/4"; 22"W x 9"H x 3/4"; 24"W x 11"H x 3/4". Line 1, which is optional, holds up to three (3) 1", 1.5", or 2" characters depending on the size of the sign. You can supply the word "The" as shown in the sample or another 3-character word. Or you can omit Line 1 all together by leaving this input box empty. Line 2 for the 18x7 sign holds up to nine (9) 2" characters. Line 2 on the 22x9 sign holds up to ten (10) 3" characters. Line 2 on the 24x11 sign holds up to ten (10) 4" characters. Character sizes are always approximate. Finish: text, pine trees, and border are painted black and the overall wood grain is highlighted and captured with a medium brown stain. Very pleased with the 2 address signs ordered.. They are made extremely well. The numbers are large and easily read. Just great!